Cowin was founded in 2006 and produces headphones, earphones and speakers. All orders from North America are shipped from China so one can assume that's where the manufacturing takes place. The Cowin web site has a lot of information on their products as well as an online store. It is also possible to purchase Cowin product via Amazon. The readers should note that the E7 model that was received for review is not the same as the one presently shown on the Cowin web site. It took a very long time for the review set to arrive, probably due to the rotating strikes by Canada Post employees that started just as the headphones were shipped. So it appears that during that time Cowin has put out a revised design. The new version has different surface finishes and appears to have a raised control pad on the side. My inquiry to Cowin on these changes has gone without response so there is no way to know if any changes were made that would influence the sound or operation of the unit! This review has presumed that the changes were limited to cosmetic items. The look and feel of this product leaves a first impression of quality. The unit arrives in a sharp looking, heavy grade black cardboard box. The box got a bit banged up during its long stay with the post office but there was no harm done to the contents. Opening the box, the first surprise was to find a nice semi-rigid black storage case; something that was not expected at this price level. 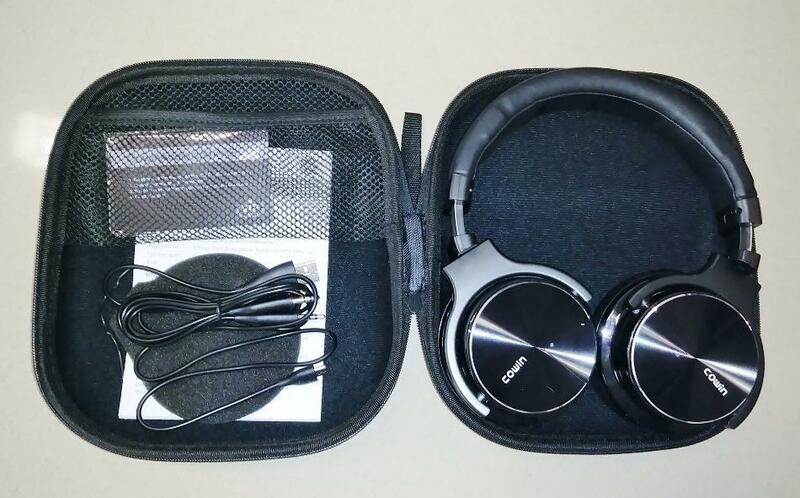 The case contained the headphones, a USB cable for charging the unit, an AUX cable for hardwired use, an instruction booklet and a "VIP" card for online registration and a "Free Gift". The free gift appears to be a warranty extension to 18 months. The headphones look and feel solid without being very heavy. The ear cushions are soft and comfortable and sit well over the ears. The headband is wide and well padded with a length adjustment on both left and right sides which this reviewer has always preferred to the one-sided adjustment style. Overall the E7 is quite light and comfortable. The micro USB charging port and the power LED are on the left headphone. The right headphone carries the AUX socket, the OFF-BT-NC switch, the Bluetooth status light and a control pad. The control pad is a pie-shaped touch pad with a plus(+) and minus(-) sign on the opposing outer corners. A touch on these corners changes the track whereas holding down the same points adjusts the volume. Connecting the headphones to a bluetooth source was quite quick and simple. It only takes the E7 about 3 or 4 seconds to recognize a bluetooth source and pair to it. Typically I was able to hold on to a source up to about 10 metres. Farther than that caused skips. 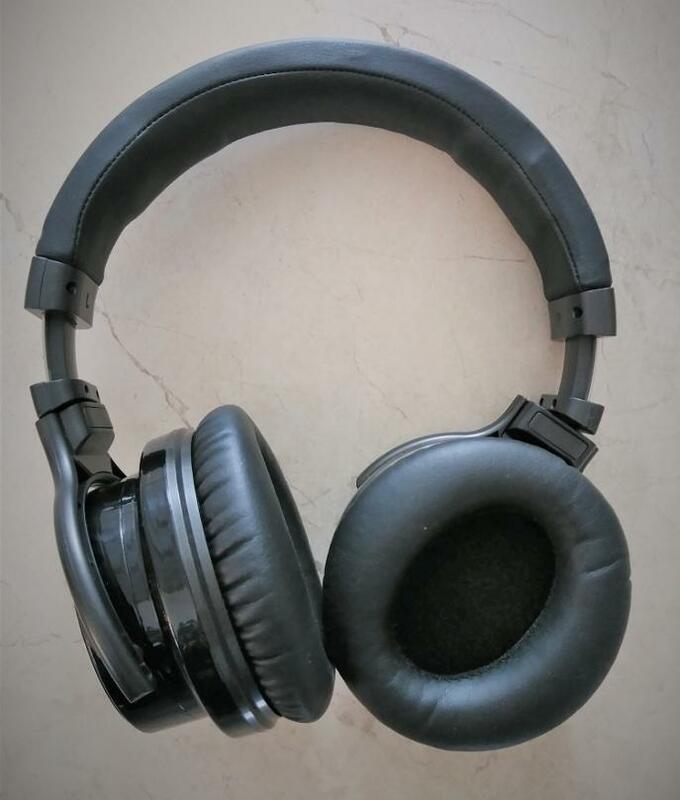 One thing to remember is that when powered on, the headphones will automatically reconnect to the last source used if it is still running. So, unless you only have one Bluetooth source it is wise to always hit the "Disconnect" button on your source when finished using the headphones. The Plus-Minus control pad has a completely smooth surface and, given that operating these touch points is done blind with the headphones on, it would have been nice to have some sort of locating aid like the little bumps on the F and J keys on my keyboard. Not a big deal but searching for the +/- keys was a frequent activity. As mentionned above, the new photos on the Cowin web site appear to show a raised triangular control pad. The E7 was tested using music from several sources, none of which would be considered Audiophile quality music streaming. The devices used included a Lenovo laptop, a Dell desktop PC, my wife's Samsung tablet and my LG cell phone. The E7 headphones performed very well in NC (Noise Cancellation) mode. The sound was clean and crisp. The full fequency spectrum was present however some might find the bass response a bit weak. To further test the bass response several tracks from Charlie Haden and Charles Mingus albums were played. The bass output was found to be quite adequate for this listener, although certainly not at a level that would be considered "big bass". The bass is considerably bigger when NR is OFF. This listener found the BT setting (Noise Cancellation Off) pushed much too much bass and not at all balanced with the rest of the music. Also, in this mode, there was a constant rumble in the background which did not appear to be ambient noise from the room but something generated in the headphones. Even with no music playing the E7 still produced a significant amount of low frequency noise in the BT position which completely disappeared when switched to NR Mode. It is possible that the E7 was designed with the intention that it would seldom be used in BT mode! The Noise Cancellation feature did an adequate job at blanking out ambient noise. It didn't completely filter out things like my wife talking on the phone in the same room but did render it sufficiently unobtrusive. The play time between battery charging is stated as a whopping 30 hours. Nobody likes to pick up something and discover that the battery is dead so a long battery life is a definite advantage. During the several weeks of using the E7 headphones there was not a single incident of having to wait for a recharge. Overall the sound was quite good in NC mode and certainly can be considered excellent for this price range. The NC system doesn't filter out all noise however consider that this type of headphone was never destined to serve as a audiophile experience. If that is what you are looking for take off the noise cancellation headphones and go to a quiet room to listen to your favorite music. Operation with the noise cancellation turned off was found to produce a lot of low frequency rumble as well as too much bass and this mode should be ignored. 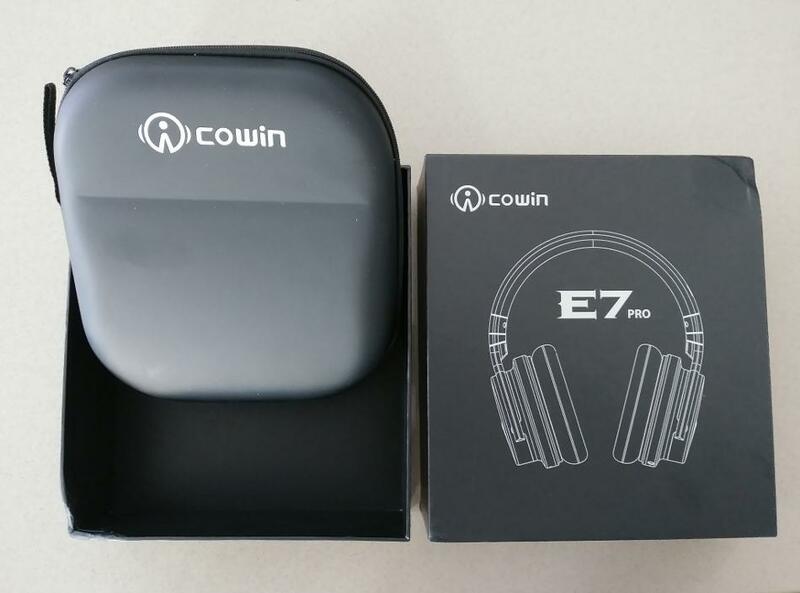 The Cowin E7 headphones are solidly built, light weight, comfortable, easy to connect and provide a clean balanced full range sound. A significant achievement for under $80. How do they do it?